My coworker went fishing in Alaska this year and had all of his catch processed, frozen, and shipped back to Texas. He gave me an entire cooler full of fish fillets, at least 5 different varieties. I cooked up most of the salmon, halibut, and mackerel but left the lingcod and rockfish for a more adventurous night. Some of the lingcod that he caught were 5 feet long and lingcods have 18 sharp teeth that you have to watch out for. Check out these pictures of the lingcod (on top) and rockfish (on bottom). They look so alien and freaky!!! 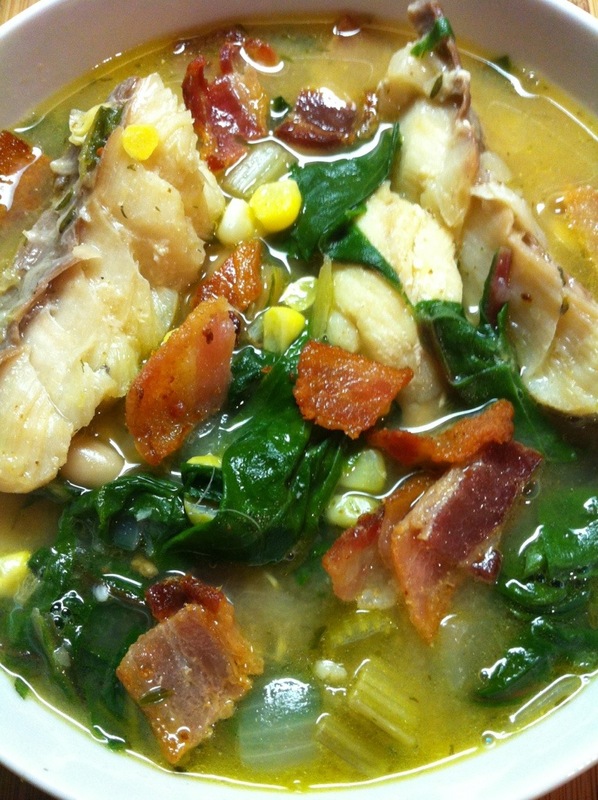 Nonetheless, I couldn’t waste his catch so I made a chowder out of them using fresh corn, bacon, and rainbow chard. Even though the lingcod is a really ugly fish, the firm meat has more flavor than regular cod and the texture kinda reminds me of lobster. The rockfish also has a firm texture but flakes easier and has mild sweeter taste. Happy with the way it turned out. Fish chowder. Bacon makes everything better. This is a very light “chowder” where I’ve omitted the traditional whole milk/cream, potatoes, and butter. The light roux and beans help thicken the broth and all of the other ingredients make this a very chunky stew. If you want something creamier and thicker, you can replace one quart of stock with your milk/cream/butter combination and substitute potatoes for the beans. Just add the milk and cream towards the end of the simmering process. Or for a healthier alternative, puree the beans or potatoes to thicken the soup. In a large stainless steel soup pot over medium to medium-high heat, add the bacon and cook for a few minutes until the fat has rendered and bacon is crispy. Remove bacon with a slotted spoon and save for later. Add the onion, celery, chard stems, and garlic and saute until vegetables begin to soften. Add the oil and flour to the bottom of the pot and make a very light roux. Add the stock, dashi, bay leaves, thyme and dill into the pot and bring to a boil. Let it simmer for awhile until vegetables have softened. Remove the bay leaves and thyme bundle. Add the corn and beans. Season the fish all over with the seafood seasoning. Add the fish and chard leaves and reduce the heat to a simmer. Cook the fish 5 to 6 minutes and gently break up the fish into big chunks. Adjust seasoning with salt and freshly ground black pepper. Serve with bacon on top. ← Braised pork and eggs in…pressure cooker!